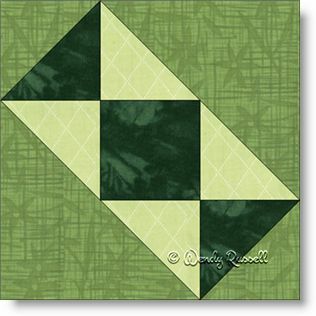 The Hourglass quilt block is a simple block that is often used as a connector block which then results in a secondary pattern when placed next to a totally different block. However, as shown in the sample quilt layouts, it can also stand on its own. I have given instructions to make this quilt block in three different sizes, but I feel its greatest effect is when using smaller blocks. This allows you to group the blocks and use rotations to create secondary patterns. So, lots of experimentation with placement can produce very interesting results. The two sample quilts show a straight set layout with rotations, as well as a setting on point. Let the experimentation begin!